Inefficient or faulty steam traps can be very detrimental to a businesses bottom line. Trap failure due to chemical build up, contaminants, or incorrect sizing of steam traps can have an adverse effect on maintaining correct temperatures and pressures. These conditions are not only a costly waste of energy, but they can negatively effect production costs as well. 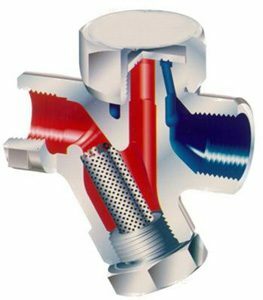 Steam traps in heating systems can be easily, and typically are, overlooked. It is important to establish a routine preventive maintenance program to avoid the inevitable loss of energy efficiency (and capital). Leaky steam traps release energy, can cause banging pipes, and cause uneven heat distribution in buildings. Leaking steam traps force the boiler to work harder, increasing fuel costs. At Advanced Water Treatment, we offer thorough inspections and testing procedures, highlighting usage, steam pressure and pipe sizing. Our custom computer-generated reports calculate estimated steam loss, and provide you the numbers you are looking for – in dollars. All of our technicians are highly qualified, and enjoy working with companies to find increased energy savings and reduced production costs. Contact us today to start realizing your energy savings potential!